When I was invited to take part in the Zombie Evacuation Race by Currys the day after Halloween I was dead excited and immediately said yes. This was promptly followed by a warning that I may be electrocuted….erm, OK, what’s a little electrocution right?! 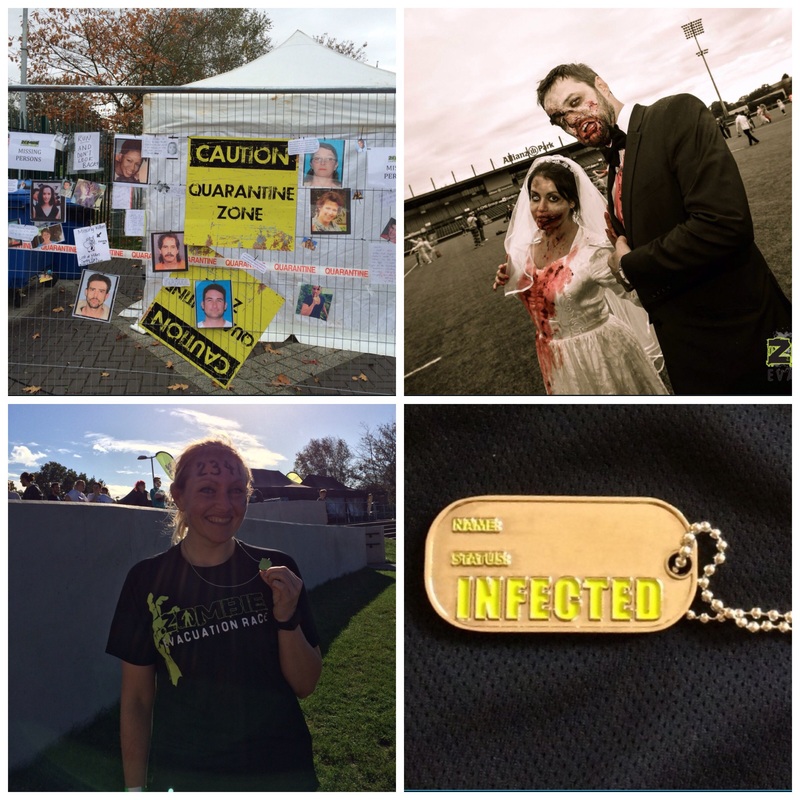 “Run for your life through a 5km course dodging the UNDEAD and navigating a multitude of challenging obstacles designed specifically to slow down your escape from relentless ZOMBIE horde who are hungry for fresh brains! Survive or be become one of them!! I arrived at Allianz Park in North London at 8am and headed to the registration tent, or the Evacuee Check-In, where I signed the bit that precludes you from suing anyone if you do in fact get infected by zombies, or electrocuted, or lose a limb, all the usual stuff. I was then given a ‘GPS tracking device’ which was a waist belt with 3 lifelines attached with velcro – loose all 3 lifelines and you’re officially infected! I met up with my fellow bloggers (and fellow Clapham Chaser Fiona who was also ready to take on a few zombies) and the nice lady from Joe Blogs gave us all a different piece of the latest wearable tech to test out during the run courtesy of Currys. I was given a Withings Pulse O2, a nifty little device that tracks steps, running, elevation, heart rate and sleep, I couldn’t wait to give it a go! There will be more on the Pulse O2 to follow as I’m still giving it a full test run but so far so good! The cold rainy start to the day had made way to sunshine and the atmosphere was brilliant. 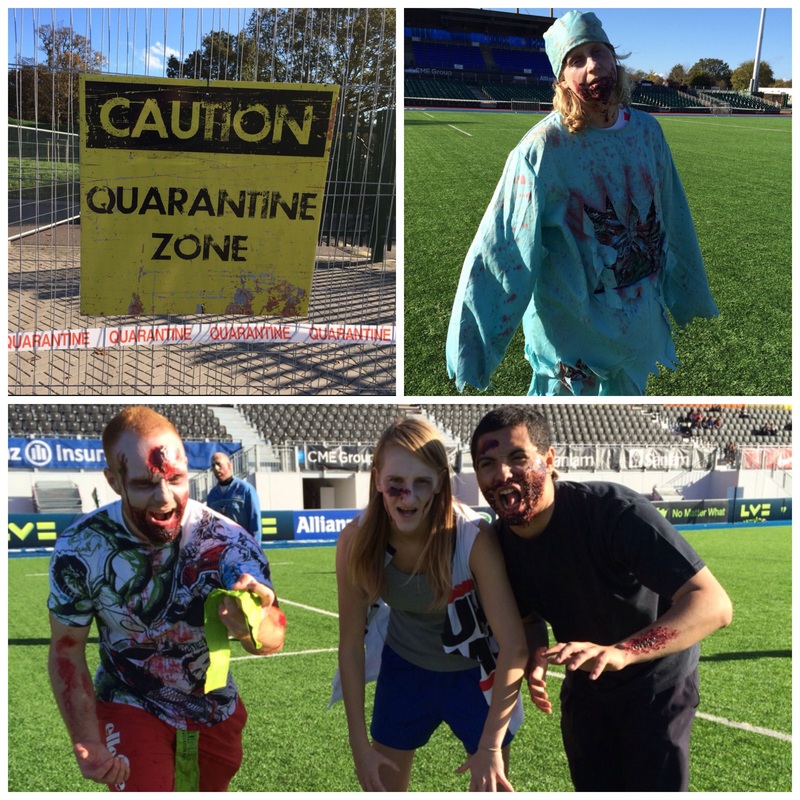 As we made our way to the start line on the track (the same track that was used as the warm up tack for the 2012 Olympics no less) ominous music was blasting over the tannoy and we could see the gruesome zombies shuffling and limping on the rugby pitch. 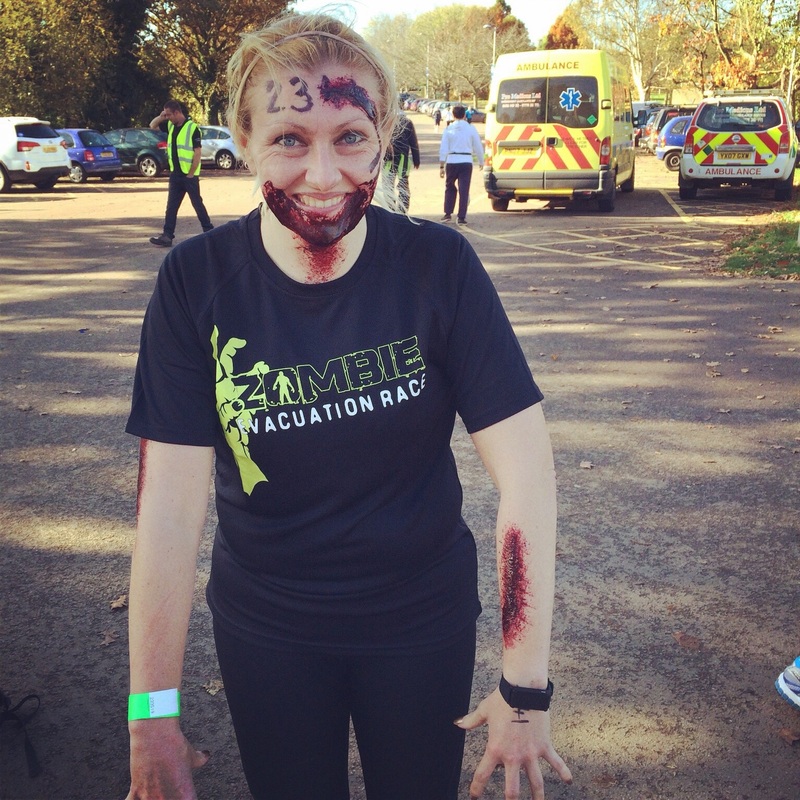 The race organisers did a great job getting everyone in the mood – a Sargent from Majesty’s RAZORS (Royal Army Zombie Outbreak Response Squadron, obvs) explained that as of 0700 hours the UK Mainland had been placed under quarantine due to a zombie outbreak. We were warned that we should not engage in any physical contact with the zombies as the infection was highly contagious and we should proceed directly to the evacuation zone – uh oh! As the zombies hovered dangerously close, eager to get their grubby infected paws on our fresh skin, the Sargent started to lead us round the track and into the woods on our mission. I really wasn’t sure what to expect but I had the same nervous energy I get when I know I’m going to be doing some sprinting, I’ve just never sprinted away from zombies before! Together with the music building a sense of fear and dread, thick smoke was pumping out on the ground creating a mist that was difficult to see through, were the zombies going to attack us already?! We started with a jog, sticking together seemed the safest thing to do, but as the course opened up and I decided to put my legs to work and go for it. All over a sudden we were rounding a corner and the music from some kind of horror film with a baby (Carrie?!) was playing and THERE WERE ZOMBIES!!! It really was quite terrifying to be faced with a group of mentalists swaying back and forth looking like death and trying to attack me…so I ran faster and screamed! 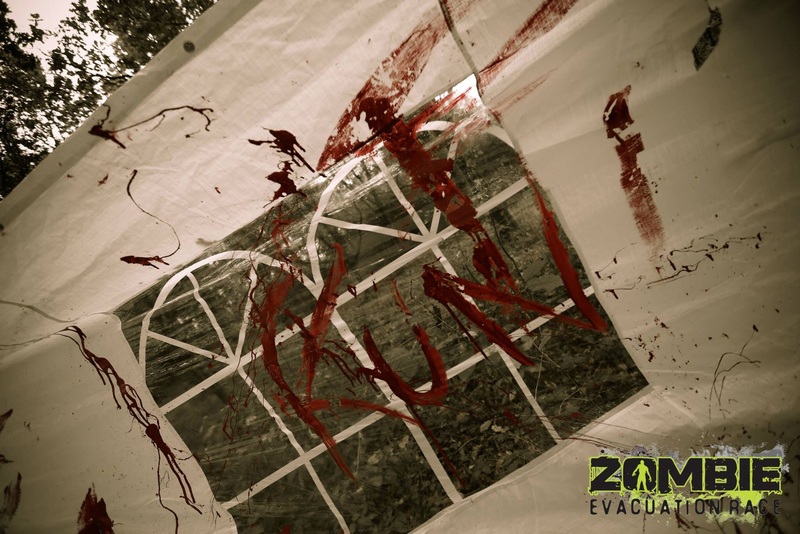 The course continued through the woods with a number of zombies zones to navigate, some covered in sheets with blood smeared over them, some zombies hidden under things waiting to pounce, some just milling around looking completely insane, there was even a zombie bridge and groom! 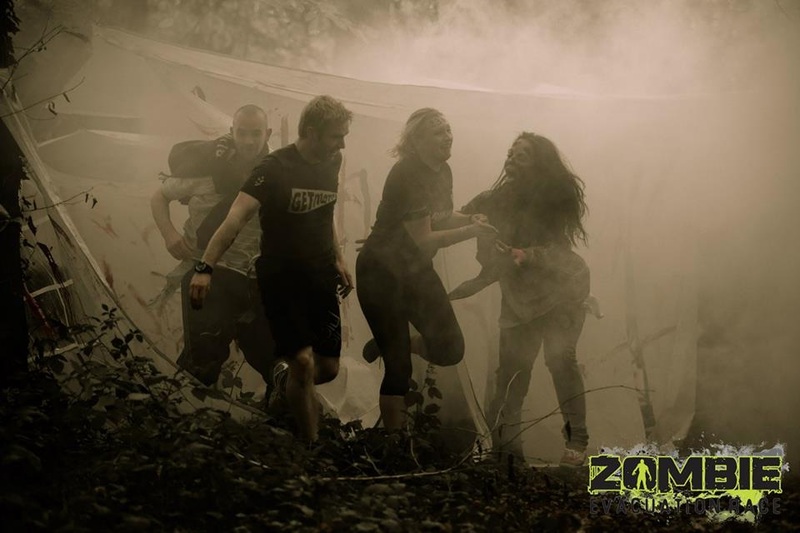 Various obstacles, as well as zombies, also plagued the way including barbed wire, ditches, dogs (although I’m not sure they were part of the course, they were much more friendly than zombie dogs…), more smoke, minefields, steps, even the brambles in the thick woodlands were attacking me! And as for this guy…was I scared to run up the stairs towards him to get past…? Maybe a little, wouldn’t you be?! My bull-in-a-china-shop approach didn’t really work and I was left without any lifelines in less than 10 minutes, a more cautious approach may have been more effective in hindsight. As the course came back towards headquarters we were taken into a large, pitch black warehouse…a pitch black warehouse full of zombies, that was definitely a scary part! Out of the warehouse we went over a bouncy castle and then were faced with the final challenge. The rugby field. This reminded me of a scene from The Faculty, stood at one end we had to run to the other but the the field was full of insane looking zombies that wanted to catch us, it was quite unnerving. Head down and RUN!!!! Of course I was already infected but it was still scary. At the end there were 2 tunnels, one for Survivors and one for the Infected..I crawled through the Infected one and I was done! 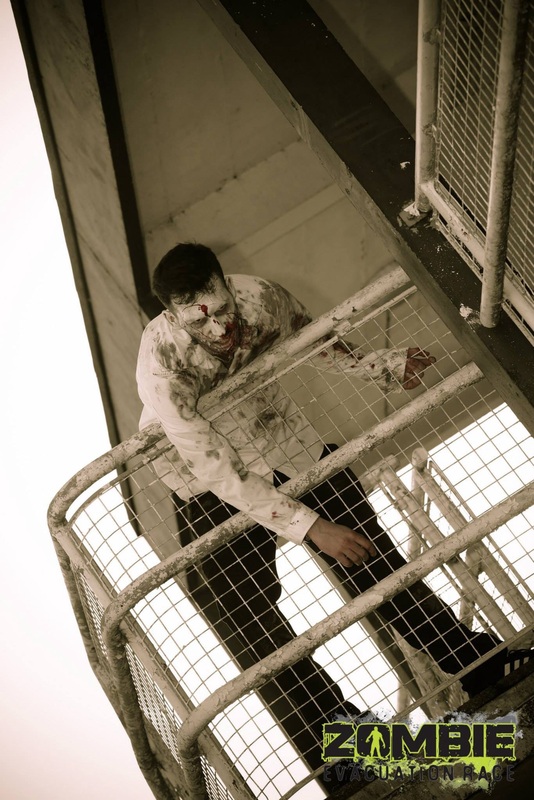 The race crew then whisked me away and turned me into a zombie so I could join in the chasing on the rugby field to scare a few unwitting suspects – it was fun, fun, fun! 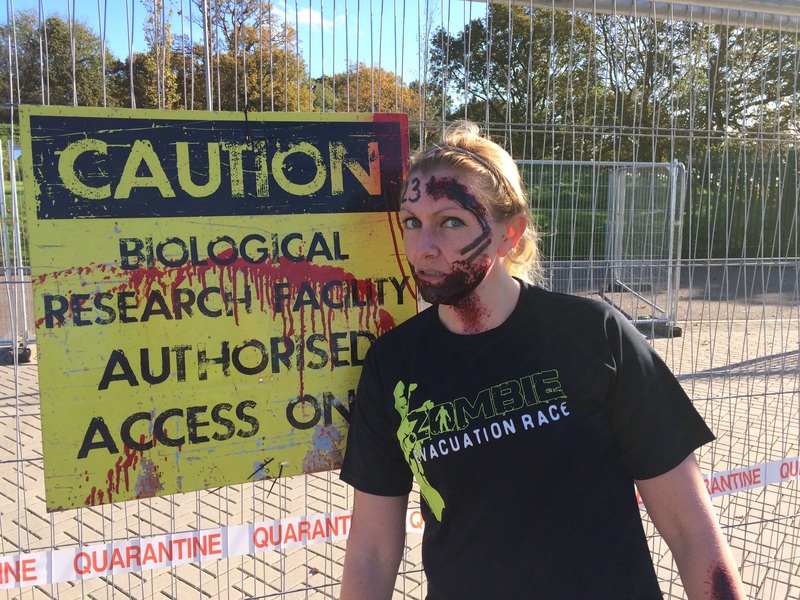 The Zombie Evacuation race was brilliant, a brilliant idea, brilliant execution and a LOT of fun. There are a few logistics that need to be ironed out (some of the course was very unclear and I didn’t actually get a finish time despite the timing chip) and it’s very expensive for a 5K, but I can promise you will have a great time. I’d like to thank both Currys and Joe Blogs for sponsoring me for this event – Currys have also featured us on their website which is here if you’d like to take a little look. As for me, well, I feel fine now. The infection’s gone. Totally recovered in fact. I mean, I’ve got a little headache I can’t shift…and a twitch in my eye…but who doesn’t?? I’m also looking a little pale but that’s nothing a little fake tan can’t fix, right?? When Laura suggested we take part I tried to think of an acceptable reason to politely decline her offer but I really couldn’t think of one. So I had to say yes. We got a team of 4 together and named ourselves Team Holy Moly after Laura exclaimed, ‘Holy moly what have we done?! It seemed apt. In a pitiful attempt to prepare for the event we got together for a couple of self run ‘boot camp’ sessions in Green Park (this allowed the Queen to watch us). We attempted a series of sprints, burpees, planks, push-ups, star jumps, tricep dips, hanging from a tree like a monkey (vital for monkey bar success), making human tunnels and crawling through them (vital skill for avoiding barbed wire in the bum) and running like Phoebe from Friends (vital for laughter and attracting strange looks from tourists). Try it – I dare you! We went up to Leighton Buzzard on the Friday night train with a can of M&S Pina Colada/G&T (very Warrior like) and stayed with Laura’s family who were very hospitable and fed us big plates of pasta and red wine to prepare us. It was a fairly easy trip to Dunstable Downs in the morning but it was a large open space so very windy and cold!! At registration they gave us a WAR body sticker/tattoo thing with your wave number on instead of a number, so I stuck it to my cheek. Quite a good idea really – my race number in the Men’s Health Survival of the Fittest was ripped off in the early stages of the race! There was also an army dude with camouflage face paints making everyone look like Warriors so we got into the spirit of things. Team Holy Moly got involved with the warm up and at 10.30 our wave set off. We started running in a zig zag on the grass (the whole course was off road) before reaching the first obstacle – giant steps. There were a couple more, including a barbed wire crawl, run up a hill with a weighted bergen and a ladder thing before a stretch of running. There was actually more running than I had anticipated, I think it was because the obstacles were grouped together rather than spaced evenly but it definitely seemed like more than Survival of the Fittest. I didn’t mind though, even the hills, the running was the bit I could actually do! 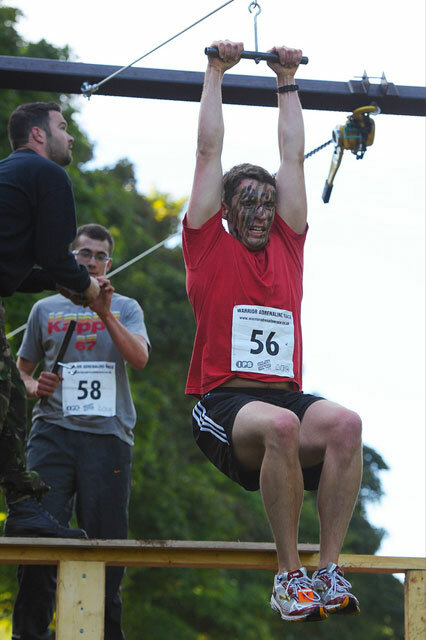 For the next obstacle you had to pull yourself up a steep slope with a rope, get over the top and climb down the other side. Simple? 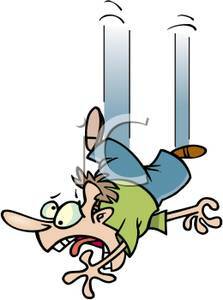 Maybe for most people but my foot slipped, I went splat and had to be yanked up by the army dude. Everyone gave me a cheer when I reached the top though! There was a stretch of running with a log (for some reason I picked a big one?! ), a spider web thing which hurt if you got pinged by it, some balance challenges and tunnels as well as some fairly steep hills to run up. When we reached the Monkey Bars I was relieved to see another army dude helping people across. I definitely would have fallen off by myself – turns out hanging from trees isn’t the best preparation after all…who knew? 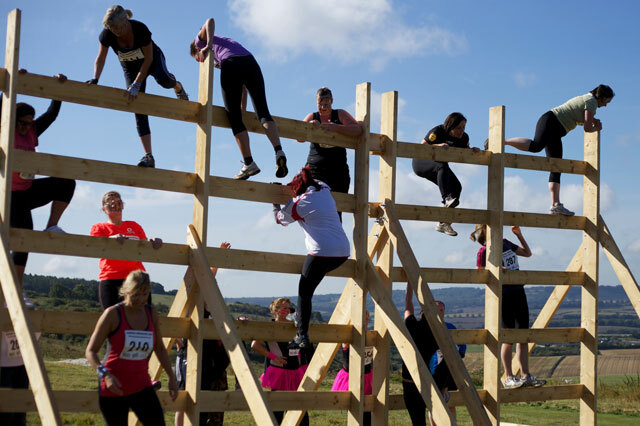 When we got towards the end of the running we got to the bigger obstacles and, as this was near the finish area, lots of spectators! One of these involved climbing some scaffolding (no problem) and jumping off onto a big crash mat 5 meters below (problem). Team Holy Moly waited for me so, with bruised face, we went off to the firemans pole (which I skipped like a loser and now wish I hadn’t), zip wire (so much fun), freezing cold dip tank (which involved ducking under logs 3 times, brrrr), a slide on a big mat (weeeeeeee), some more crawling and paintball!! Paintball wasn’t on the list of obstacles so I’m guessing this was the unspecified ‘new obstacle’ – they gave me a helmet and I sprinted across the danger zone narrowly avoiding getting hit. 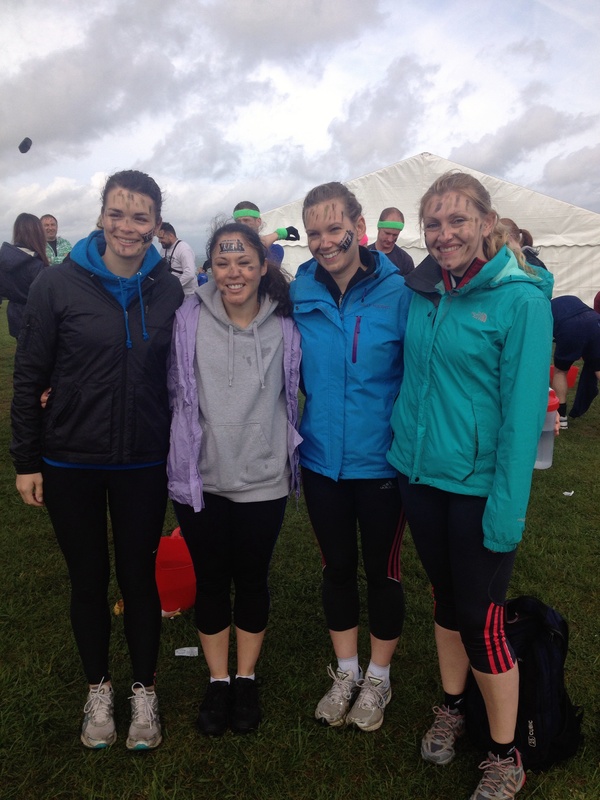 Unfortunately Laura and Helen both took a paintball to the leg and ended up with lumpy bruises – ouch. Finally there was the big wall and then the finish line. 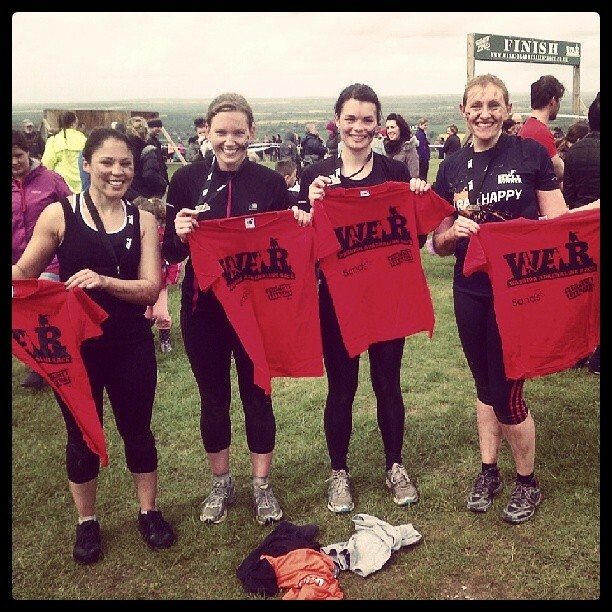 Team Holy Moly completed the challenge – wet, cold & dirty! 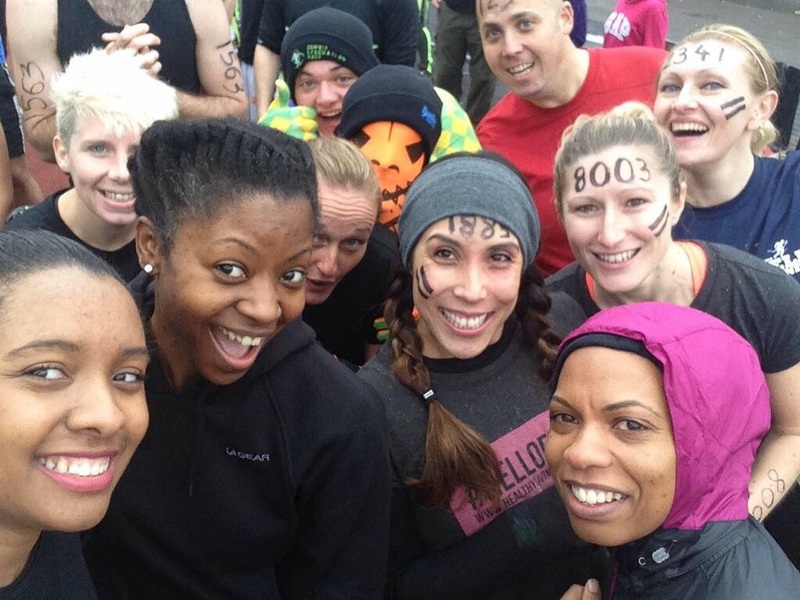 The Warrior Adrenaline Race was fun! There’s a 5k or 10k option with people setting off in several waves to help keep congestion on the course to a minimum. 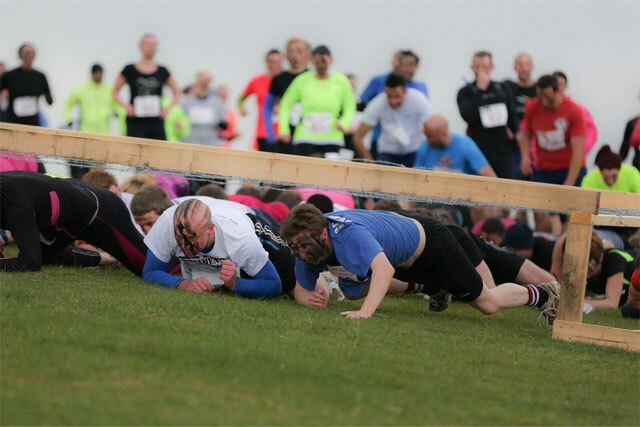 There was about a 5 minute wait at one of the obstacles but the rest were fairly quick moving. I thought it was quite well organised with all the obstacles manned with at least 1 army dude who were willing to help if needed. The only complaint I would have is the lack of water – there was 1 water station on the route but there were no drinks at all at the end which I thought was quite poor. We did get a medal and a t-shirt though.